If you have an Office 365 license that includes Office Pro Plus you should know that you get the full Lync 2013 client for your desktop. 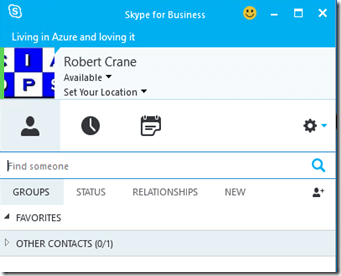 Hopefully, you are also aware that Lync is being renamed Skype for Business. There is a preview of the client that you can download and look at right now. What you may not be aware of is that on April 14 2015 (i.e. the next patch Tuesday) the updated Skype for Business client will automatically be downloaded and update any existing Lync 2013 client application you have running if you used the ‘click to run’ install method from Office 365. Yes, that is correct. If you do nothing, then on April 14th (US Time) your Lync 2013 client will automatically be replaced by the new Skype for Business as shown above. If you look after a lot of Office 365 users with Office 365 Pro Plus who use Lync now, expect quite a few phone calls (hopefully some Skype for Business calls!) in regards to this change. The new Skype for Business actually contains both the old Lync interface as well as the newer Skype for Business look and feel. This means that you can actually switch the interface back to Lync 2013 look and feel if you want. How do you make this change? PowerShell of course! If you then restart Skype for Business you should see the familiar Lync 2013 interface return. The main point to remember is that if you current have Lync 2013 installed from Office 365 and you do nothing, then come April 2014 you’ll have Skype for Business on your desktop.